The Flex-Hone® for Chamfer Blending has the ability to blend and radius sharp edges and remove microburrs on chamfered holes eliminating stress risers caused by the chamfering operation. Available in a variety of grit sizes and abrasive types and is suitable for finishing titanium, inconel, super CVM and nickel based stainless steel alloys. This tool eliminates hand finishing operations and produces consistent finishes from hole to hole, part to part. To learn more about our chamfer hones, download our product brochure. Contact a distributor today to order your flex hone for chamfer blending tool. 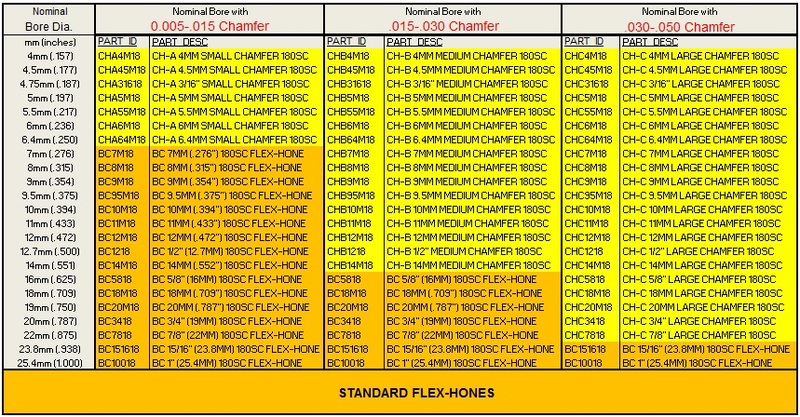 Need Help Selecting A Flex-Hone® for Chamfer Blending? For instance, if your bore is 7mm and has a chamfer of .45mm per side the proper selection is CHB7M18. 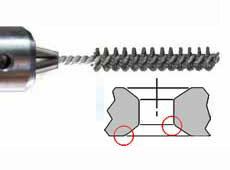 For a .500 diameter bore with .045 chamfer per side, the correct tool is CHC1218. Currently, we only offer 180 grit Silicon Carbide for our Flex-Hones for Chamfer Blending. Other grits and abrasive types are available on special order. mm (inches) Part ID Desc. Part ID Desc. Part ID Desc.